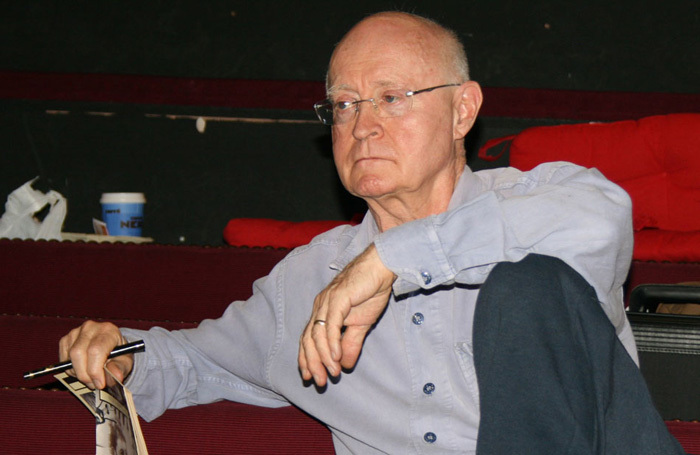 Veteran playwright Edward Bond has struck out at the state of English theatre, claiming it is patronising, childish and serves no function. After announcing that “English theatre is dead”, the dramatist said that dumbed down productions were steadily making theatre audiences less intelligent. Bond is preparing to direct his new play Dea at the Secombe Theatre in Sutton, and suggested he had chosen the theatre because he could make riskier work there than he could at major companies, including the Royal Court Theatre, London, and the Royal Shakespeare Company. “I think English theatre is dead. I think it serves no useful social, creative function, so I work mainly abroad,” he said. “What has happened to English theatre, English society, is it has become infantile. It is not dumbing down, it is actually becoming infantile. You turn on the television and it is infantile. You are patronised as if you are a little child,” he said. Bond claimed modern theatre only appeals to the emotions of the audience, and no longer tries to stimulate their intelligence. He said: “They have evolved to work together but in our society we divide [emotion and intellect] like a guillotine – intelligence is for machines; emotion is for the audience, who have got to be stupid. Bond’s contemporary Tom Stoppard raised similar concerns in February last year, after revealing he made edits to his latest play after preview audiences failed to understand several jokes. Stoppard’s remarks prompted actor Janet Suzman to claim audiences are “not as well educated” as they used to be, while Patricia Hodge agreed there was a “huge amount of truth” in Stoppard’s claims .